It's been a big week, leaving the comforts of home and all my friends for unknown adventures in the far east. Why did I do it? Why not? What are we doing here if we're not going to break out of our little bubbles and push the boundaries of our comfort zones? Honestly, I picked Shanghai as a jumping off point because it was easy. My older brother has lived here for years, I have friends, I've visited, and I love the food! My adventure couldn't have begun at a better time either- Chinese New Years. China welcomed me with a firework show that spread the width of the country, I had an uninterrupted view of it from my window on the plane. Little explosions colored the night sky below me and guided us safely to Pudong International Airport. I've been looking forward to this week for a while because I'm not the biggest fan of crowds (I know- I'm in China, it's unavoidable... but remember those comfort zones we're breaking). Chinese New Year aka Spring Festival is a time for family. Everyone leaves the city to return to their hometown or vacation elsewhere across China so it's been fairly quiet here in Shanghai. Maybe only a million or so people around! For the most part I've taken it easy while I settle in, (so much movie binging!) 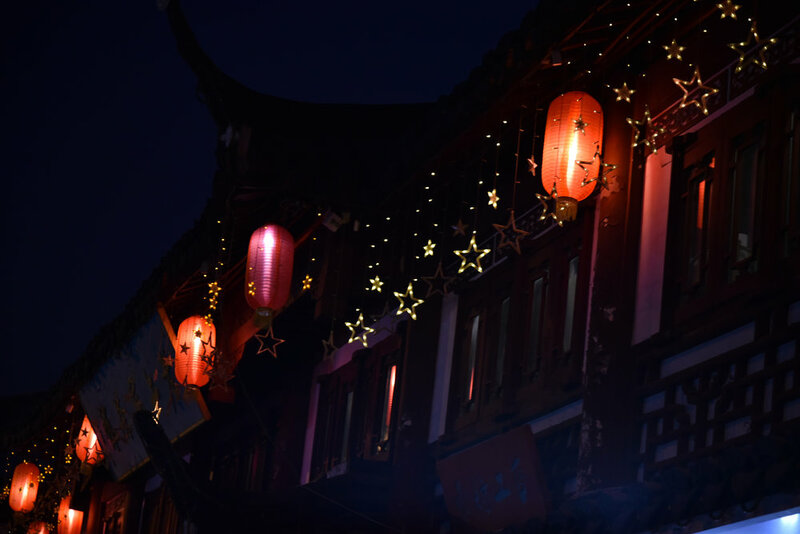 but yesterday while the sun was out I met up with some old friends to go see the Lantern Festival at Yuyuan Garden. Let me tell you, these are not your average paper lantern! It's a gorgeous display of delicately hand crafted lanterns that come in all shapes and sizes. At night they light up, they stick around for about a month, and then they fly away like hot air balloons when the festival is over (just not inside the city). I do sort of feel like I've just dropped in on a part of the world where I have no clue about anything thats happening or has happened in the past but that's what makes it so fun! If my first few days are telling of the future, leaving the comforts of home with 2 1/2 suitcases and a backpack was definitely the right decision. But don't worry, I'll keep you posted :).